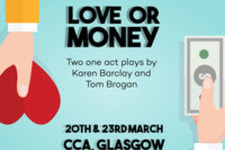 Tom Brogan and Karen Barclay are no strangers to the Glasgow International Comedy Festival, returning this year with two one-act plays, Love Or Money. Karen Barclay's 'Vote For Love' is a 35 minute play following vintage fashion seller, Suzi Love. Suzi moves in with sister Pamela who is busy running for the local by-elections, so busy in fact that the audience never meets her. On day one of the move Suzi meets her land lord, Archie Harris, who surprises her with news that he's also her brother-in-law. Suzi quickly learns there's more to Archie and the election than meets the eye and finds herself in the centre of a bitter political campaign. The play is well written and perfectly timed, however, both characters are a bit too quirky and at times their eccentricities detract from the narrative. Tom Brogan's 'Some People' takes a realistic look at love in all forms - mother and son, father and daughter, and man and woman - a hard feat but Brogan successfully explores all 3 in a humorous way. Single parents David and Ruth have been summoned to school to sort out a squabble between their kids, leading to both of them being placed on the school board. As time goes on the audience is given a glimpse into David and Ruth's rocky pasts and future hopes through their heartfelt interactions. These characters are flawed which brings them to life as the 75 minutes fly by. Natalie Clark and Paul Kozinski tackle both plays head on, showing their adaptability by balancing spot-on comic timing with the more emotional scenes. Love Or Money delivered exactly what it said on the tin, and made for a thoroughly enjoyable evening.